After learning about the resources consumed by traditional landscaping, I started this business in 1999 with a focus on lawn alternative & naturalized landscapes. Since that time we’ve evolved to offer a full suite of sustainable landscape solutions; but, until now, have been leaving out a big piece of the puzzle –professional aftercare. So how can landscape maintenance be sustainable? 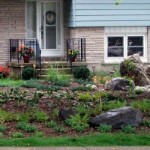 In the spring of 2011 we launched this area’s first zero emission landscape maintenance division, serving Kitchener, Waterloo, Cambridge, Ayr, Paris, and the surrounding areas. Well, the first thing that had to go was gas. In the spring of 2011 we launched this area’s first zero emission landscape maintenance division, serving Kitchener, Waterloo, Cambridge, Ayr, Paris, and the surrounding areas. The service uses only ‘people powered’ and battery operated equipment for maintenance operations. Reducing air pollution and fossil fuel consumption is the main goal, but may be only part of the advantage to consumers; the equipment also very quiet – up to half the noise levels of gas-powered counterparts. 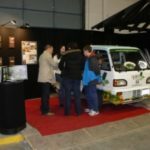 And at pennies a ‘tank’ to recharge the batteries, with no messy fuel spills or oil leaks, the appeal continues to grow. The service vehicles employed, Japanese Kei trucks, turn heads wherever they go. Although these little trucks are not electric, they do achieve amazing fuel mileage (approx. 13km/L) for their capabilities, so as gas prices continue to rise, Quiet Nature’s services will become more and more competitive. 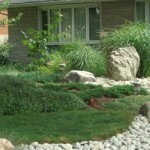 Feel free to contact us today for information on our landscape services or the types of equipment we use. Congratulations!!! I have been waiting a long time to see a company like yours! I live in an area where everyone uses lawn care companies (except us and our neighbours beside us) that use big, noisy, gas powered lawn equipment that literally shatters the quiet every day. I have always thought that we needed companies like yours and I was so pleased when I found you, and right in my own backyard. I live in West Galt (Cambridge). My husband and I will be contacting you in the near future. Thank you!